Emotional distress is commonly seen in individuals with Alzheimer’s disease and other related dementia’s, such as Vascular disease and Parkinson’s disease. Knowing how to handle a dementia patient who is highly anxious or extremely upset is key to calming the person down and preventing emotional escalation. The following tips will assist in deescalating the emotional distress of an individual with dementia. From there, try to determine which emotion, such as fear, anxiety, anger, frustration, etc., the individual is feeling. Express empathy and utilize phrases, such as “it looks like”, “it sounds like”, and “it seems like”. Doing so allows you to make note of the situation and reflect it back to the individual with dementia. With an individual in an earlier stage of Alzheimer’s disease, redirection can be used to decrease emotional distress. You see what the individual is doing and / or saying and you direct their attention in a slightly different direction. For example, in the video, an individual with dementia is upset and anxious, looking for her mother because she needs her to fix her dress. The caregiver redirects her by saying, “She did a lot of sewing, didn’t she.” This leads the woman with dementia to talk about how her mother handmade everything, including her wedding dress. The caregiver then asks about the wedding dress, and the woman’s need to find her mother to fix the dress she is currently wearing all seems forgotten. For those who are in the later stages of dementia, distraction, rather than redirection may be required. Distraction is taking the dementia patient’s attention away from what they are feeling and / or thinking by distracting him or her with something else. Since language becomes an issue as the disease progresses, distraction will need to be done with an object. An example of distraction is as follows: A caregiver uses a positive physical approach and hands a highly agitated Alzheimer’s patient (who loves cake) a slice of cake. This causes him or her to forget all about what was distressing, as the focus is now on going to eat the dessert. 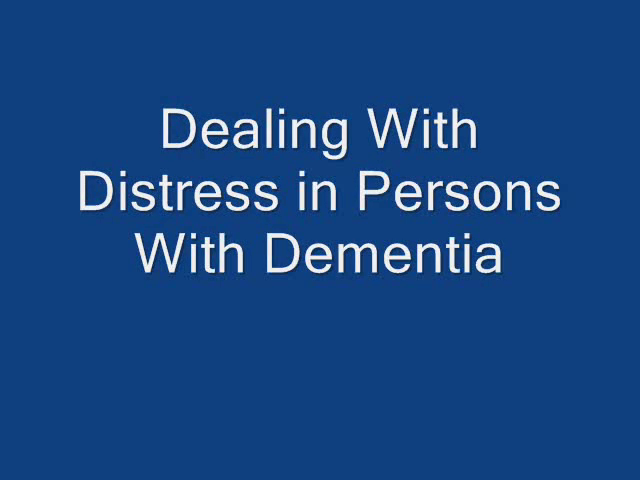 Learn how to deal with emotional distress in a person with dementia. Includes using the "Positive Approach".